Our family worship services, usually on the second Sunday of each month, have taken on a new way to worship. We have a team that prepares the services, bringing ideas of games, crafts, themes for the service, displays, songs, stories. Often we sing songs that the children sing at school; sometimes we sing modern hymns, and occasionally we sing some of the fun choruses that were written many years ago that many of us remember from when we were children. The children take part in the services by reading the story, saying a prayer, or leading action songs. We use powerpoint to help us tell the stories, or sometimes we dress up and act it out. We’ve also used puppets to help with a story. 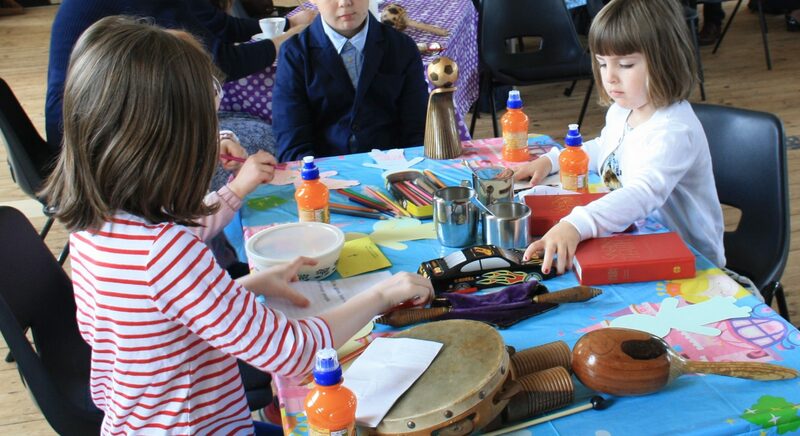 The craft activities are enjoyed by adults and children alike—everyone joins in (with great enthusiasm!). These services are usually held in the hall at the back of the church, and are café style—this means we sit round tables, and not in rows. This makes it easier to do the craft activities and to share conversations and ideas with each other. We begin by sharing tea/coffee from around 10.10am and having a chat and the service begins at 10.30am. To reflect our new style of worship we have given it a new name—FUNDAY SUNDAY. Please feel welcome to come and join us at any of these (& other) services.